Click through our site to find out about the most complete, fully researched, bio-mechanical, western riding and training technology available in the world today. 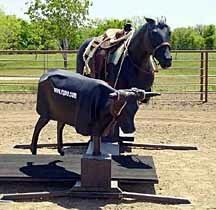 Find out about a system that's about "how good you could be" with competent, understandable, provable reasons and answers why, even the best, can improve their riding, roping and horsemanship capabilities. Check back often since this site will be updated frequently. 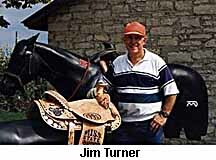 TeamRoping.com: Team Roping training will change forever. Click for more information. ROPRO Upfront Saddles: Learn about better saddle fit for you and your horse and how to overcome your balance problems in a Patented (U.S. Patent No. 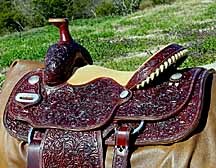 5,953,889), vertical balance, custom, handmade western saddle. Articles: Read articles written and published by David E. Jones, inventor of ROPRO equipment and developer of ROPRO Training Systems. 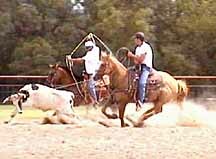 Linda Jones, partner in ROPRO Training Systems, authors articles and shares insights about roping from a wife's perspective. Find out why you may not be reaching your full western riding and roping potential because of misunderstood and unproven training basics. 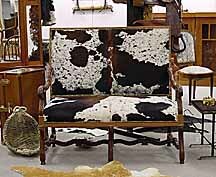 Ranch Works "Recreations" Turn of the Century Antiques, Collectibles and just "Good Old Furniture" with a Western Flair. Magnificent natural cow hide and smooth leather covered, original pieces. No reproductions. Original, one of a kind, handmade items. Want something extra special? Order a custom designed, one of a kind, hand crafted and "recreated" original. ROPRO Company: Read articles and view pictures about the History of ROPRO, meet David, Linda and Michael Jones and other key ROPRO personnel. Endorsements: Articles, pictures and letters from customers will give you an idea of how well our training systems could work for you. Notes from the "Training Room": Hosted by Scott R. Jones, NSCA, AFAA Certified Personal Trainer/Cooper Clinic Bio-Mechanical Specialist. Read a variety of articles authored by Mr. Scott Jones and other specialists concerning training the human body for athletic competition. 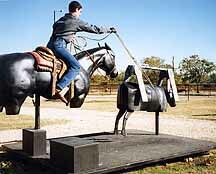 For Sale: View the "Quality Roping Horses" we have for sale. Check out the "Horse Trailers" for sale, if you are looking for a great trailer. 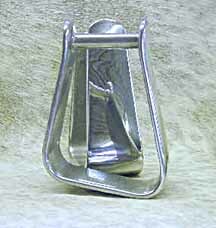 The "Equipment" and "Saddles and Tack" sections will have listings when items are available. (Pictures, Text and Video Clips). CONTACT ROPRO: Sign up on our mailing list or e-mail us directly from this site.